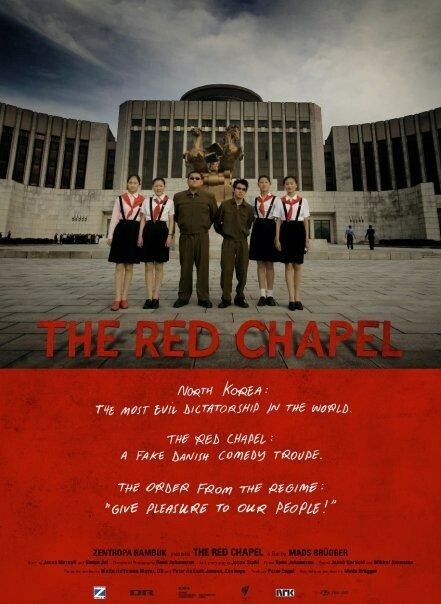 The Red Chapel is not what you would call a typically Korean film. I am using it for my first entry in the Korean Blogathon because I feel like it is far too important to go unnoticed, especially amongst people who have more than a passing interest in Korean Cinema. The identity of Red Chapel has a semi-permeable membrane. Sometimes identifiable as a Danish picture, sometimes Korean, sometimes an amalgamation of both, this film has nationalism floating in and out of it like rubber toys in a kid’s swimming pool, creating a piece that is, above all, complicated as hell. 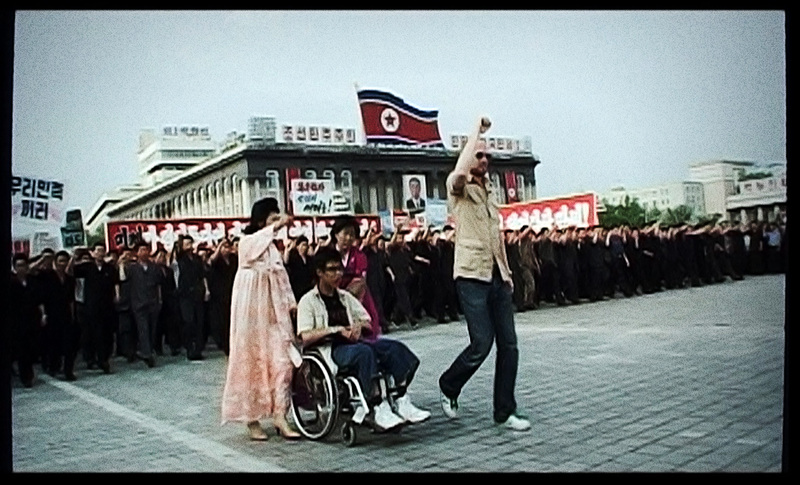 Directed by Mads Brugger (a caucasian Dane), and starring Simon Jul Jorgensen and Jacob Nossell (two adopted Korean Danes), this documentary tells the story of how the group of them traipsed into the hermetically sealed, totalitarian dictatorship of North Korea to perform a comedy bit/routine. “Comedy is the soft spot of all dictatorships,” says Mads’ voiceover during the first 10 minutes of the film, and he is not incorrect. It is common knowledge that Hitler himself owned a copy of Charlie Chaplin’s film The Great Dictator, and was said to have loved it, and that was the film that made fun of the man himself! However, as Red Chapel moves forward, it becomes a harder and harder film to watch, and the comedy drains from it. Reviews called this film a “more intelligent Borat,” and one of my best friends even acknowledged that, essentially, North Korea gets “Punk’d” within these somewhat harrowing 87 minutes. But I have a difficult time with either of these simplifications (even though I realize that my pal’s comment was just an off-hand remark). The reasons for my discomfort have to do with what I feel is a very tenuous situation that evolves within the film between the filmmaker, his actors (friends? 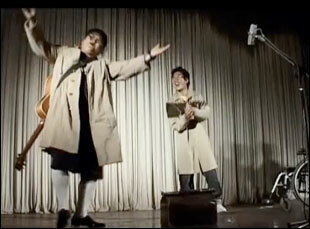 ), and the North Korean company that they keep/situations that they are in. Jacob and Simon are young men who have been raised in Denmark virtually all their lives. It seems that they were given up for adoption by South Korean parents when they were extremely young, and have grown up in Denmark. While they are aesthetically Korean, they speak Danish and are, more or less, culturally Danish as well. In addition, Jacob is a self-described “spastic,” making language even more of an issue (even his English is subtitled). Upon being approached to do this project, one could see how these young men would find it appealing. While North Korea has clearly not been even slightly part of South Korea for 50 years and counting, it is still close enough to these boys’ heritage for them to want to go back and want to investigate, dictatorship or not. Oh North Korea…what a place! The Red Chapel is an incredibly important film because it goes behind the scenes of North Korea in a way that nothing has in many years. It is also crucially important because it dissects Korean individuals who have been once removed from their home country, and are asked to revisit not only their originating culture but also come to grips with aspects of their history that they didn’t necessarily know that would have to face or want to face. While Korea was split into North and South in 1945, and the two locations could not be more distinct at this point, the simple fact is that the country used to be one and it is the location that Simon and Jacob both hail from originally. The most fascinating element of the entire film was that, while skewed to “expose the evil of the system” (as Mads’ voiceover states), the most evil was revealed through the smallest and most seemingly insignificant details. While we are told about people starving by the millions and the various tortures and death camps, it was actually Jacob’s total experience and the reappropriation of the comedy show that truly seals the deal. While discussing all the North Koreans that they have been dealing with throughout the film, Jacob says sadly at one point in the film, “It’s psycho, cuz they’re all really nice to me.” While he’s right, it also made me wonder what his treatment in Denmark was! The North Korean treatment of Jacob was gut-wrenching. First of all, they wanted to look good in front of the camera. Not only did they want to look good so that they could make their Dear Leader (Kim Jong Il) happy, but they did so in order to make North Korea look less like the totalitarian regime that it is. According to Mads, had he been born in North Korea and not in South Korea, Jacob would’ve been aborted or killed due to his disorders (spastic/cerebral palsy). His “specialized treatment” by their “handler” Mrs. Mak was not only completely unusual but also basically impossible in the Kim Jong Il Reign. As the film progressed, and we were introduced to the comedy routine that Simon and Jacob were to perform, we were also introduced to what North Korea actually was. It became clear to me that the voiceovers by Brugger that told us of all the Kim Jong Il horrors were almost unnecessary when we saw what became of the show: it was ripped to shreds. The “cultural exchange” that Brugger kept discussing with the North Korean handlers that had been assigned to Simon, Jacob and Brugger became nothing but another form for North Korean propaganda. Big surprise, eh? Not only that, but they managed to marginalize Jacob’s character as well, frustrating the young actor and depressing him even further than he already was. Mads Brugger commented over some stock footage of North Korean dancers that people in North Korea lost their identity to the totalitarian government of Kim Jong Il, their Dear Leader, and were nothing but pixels. This analogy fit the bill just perfectly. Within the new show, Jacob lost his voice and his agency and Simon became nothing but a robot for political discourse. Pixels, when put together, fit into a picture. This is exactly what the North Koreans were hoping to see happen. There was to be no cultural “exchange” within this particular experience. In a way, the most disturbing part of the film was that Mads Brugger knew that this would happen and Jacob and Simon did not. Not only were they pixels for the North Koreans, but they were pixels for Brugger’s own political agenda. At a particularly painful section in the film, Jacob spits out at Mads, “You have no moral scruples, do you Mads?” and, at that point, it is quite clear that he seems not to. There is always the chance that when they get back to Denmark it will be fine and good, all will be explained, and things will be peaceful again, but in a sense the director seems to be as much of a totalitarian as Kim Jong Il, just with Leftist ideals. Jacob spends a good amount of the film in pain, and is the one person who points out that the North Korea situation is not as simple as we think it is. The beautiful thing about this film is that we are able to view the film through the eyes of two young Korean-Danish boys and one Caucasian Danish adult, and it seems that the outcome is more deftly complicated than when we started. One can argue that a totalitarian government is always wrong, and politically that is 100% correct. But what about the people? Mads Brugger’s voiceover seems to be intentionally black and white, so as to lay out the “evil vs. good” arguments that many people in the world seem to be obsessed with. What balances it out is Simon and Jacob, the Korean youth, who see that experiences with human beings in a country make any black-and-white argument problematic and place it into a state of grays. North Korea has never been seen in this way due to the political nature of the country, and it is a groundbreaking move. While it did not take place within the confines of the country itself, there was a cultural exchange that took place within the context of this film and the participants in it. When Jacob and Simon sing Oasis’ Wonderwall with a group of North Korean schoolkids you can see that these two young men have broken free of what they previously were in Denmark and reached a new identity that encapsulated their Korean-“ness” as well as everything that they were before. They regained whatever agency that the North Korean “handlers” had attempted to remove from them and reinstated it within themselves. The two young men that returned to Denmark were not the same men that went to North Korea, and that in and of itself is a big deal. The Red Chapel is a wonderful film and, while it is alternately disturbing and emotionally wrenching at times, I found it to be highly worthwhile. If you get a chance, please please please put this on your “to see” list. Where can I get this? Sounds pretty interesting. I’m not sure where you might be able to get it…I saw it in a crappy theater in Downtown Los Angeles. It was worth the terrible theater experience to see the film though. It was REALLY amazing. WAY more than what I was even able to describe! This sounds fascinating, I hope I can find it! It really is. I hope that it at least comes to netflix or something, if nothing else!